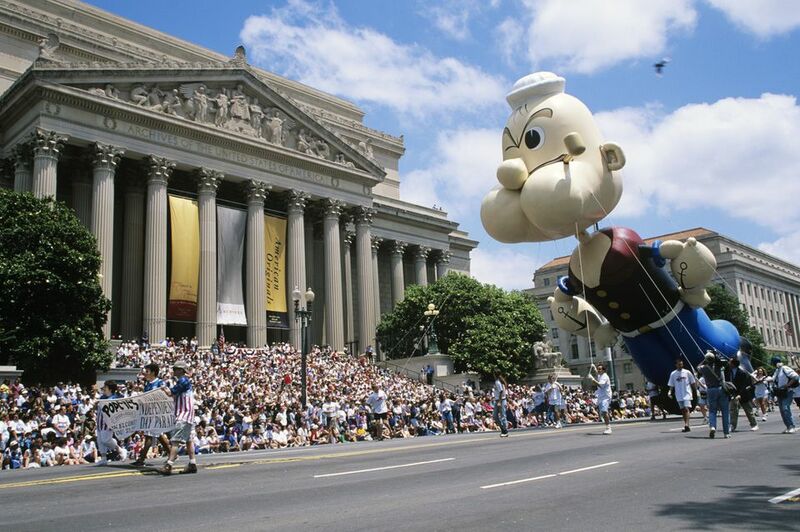 Washington, D.C.’s Independence Day Parade features marching bands, military and specialty units, floats, and VIPs. The 4th of July Parade is a red, white, and blue celebration of America's birthday and draws a large crowd. Washington, D.C. is a spectacular place to celebrate July 4th and the parade is the beginning of a packed day of celebrations for America's birthday. America’s National Independence Day Parade brings marchers from across the country to the nation's capital for an annual patriotic display that's been going on for years. The parade kicks off a full day of DC events to celebrate America's birthday, culminating in a spectacular fireworks display with the U.S. Capitol in the background. The parade is co-hosted by the National Park Service and produced by Diversified Events, which is under contract to the National Park Service. The parade route is one mile in length. It begins at 7th and Madison Drive, and proceeds north on 7th Street to Constitution Avenue NW, then west on Constitution Avenue to 17th Street. The parade ends at Constitution Ave NW and 17th St NW. See a map of the parade route. The parade begins at 11:45 a.m. and ends at 2 p.m. Parade organizers suggest that you head towards the end of the parade route, at 17th St NW, where it's often less crowded and easier to see the route. Here are more tips for a fun parade experience: arrive early to find a good viewing spot. Bring food and water as vendors will be available, but lines may be long. Dress appropriately for the weather. Shady spots are at a minimum, so be prepared to cope with hot and humid weather. One more thing: feel free to wear patriotic clothing to show your American spirit. Public access to the National Mall begins at 10 a.m., and all visitors are required to enter via a security checkpoint. Read more about getting to the National Mall, public transportation, parking, security and road closures. Marchers each year include drill teams, bands, fife and drum corps, floats, military and specialty units, giant balloons, equestrians, national dignitaries, and celebrity participants. Wave a flag as marching bands strut down Constitution Avenue. The National Park Service strongly encourages Fourth of July visitors to take public transportation to activities in Washington. Public parking will be extremely limited. According to NPS, a few of those limited parking spots will be available on Hains Point, accessible via I-395 or Maine Avenue from the east only. Cars will not be allowed on or around the National Mall, and there will be numerous road closures that will make it tedious to navigate around Washington, D.C. and along the George Washington Memorial Parkway. Here's a list of tentative road closures. Following the parade you can spend the afternoon enjoying the cultural festivities at the Smithsonian Folklife Festival which takes place on the National Mall from 11 a.m to 5 p.m. A variety of activities will keep you busy throughout the afternoon. A Capitol Fourth Concert begins at 8 p.m. on the Capitol grounds and the evening ends with a spectacular display of fireworks over the Washington Monument.